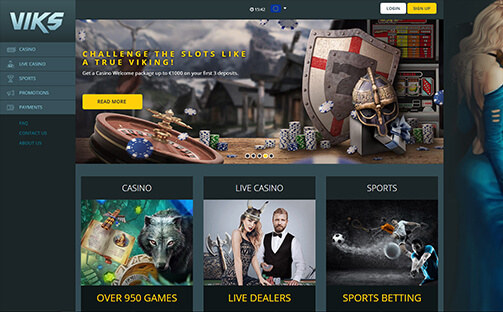 We always try to see what others have to say about any online casino brand before we end up playing there ourselves and we quickly discovered that Viks Casino is one of the most highly regarded gaming brands in the world by the general gaming population. Considering that we had never heard of the casino previously, we were actually rather excited to find out exactly what that was all about and approached this review full of hope if we are being completely honest! Other than that, we had never played here before or anything, and so we were able to approach this review completely fresh and with the same set of eyes that any new player there would be using – so let’s find out how we got on. Upon arriving at Viks Casino, we found something that actually looked pretty traditional. It doesn’t look bad by any means, but we figured that the parts of the experience that had other players raving about it must be located elsewhere within the casino as the main page is not going to take your breath away. Admittedly, we did discover right off the bat that this is an entirely instant play casino that features NetEnt games prominently on the main page. There is also a sports betting tab in the main menu for any players that like to get involved with that along with their regular casino gaming. We did not have to look too far on the main page to discover which other developers were backing up NetEnt here, as there is a dedicated sort tab for them all. Upon clicking it, we found Microgaming titles, which are always a decent addition, plus games from NYX and Play’n Go. What really stood out to us, however, was the inclusion of IGT slots at this casino, which sounds like a great deal to us. If you’re a land based player then you’ll undoubtedly have fallen in love with many of the brand’s games over the years and the vast majority of the most popular titles have been brought online in style. They may not be the newest games, but the likes of Cleopatra and Siberian Storm continue to rank among our all-time favourites and they continue to serve as some of the most attractive and appealing games to play here at this casino. The one area that casinos like this, which bring together NetEnt and Microgaming titles in one place, usually fall down is when it comes to jackpot games, so we headed straight to that tab on the main page – and it is fair to say that we were absolutely delighted by what we found. All of the major Microgaming and NetEnt jackpot slots were on display in all of their glory, including Major Millions, Mega Moolah, Mega Fortune and Hall of Gods. They are all offered without missing out on the smaller games too and players can effortlessly switch between those big names and the likes of Cash Splash, King Cashalot and Cosmic Fortune, and there’s even a jackpot version of Casino Stud Poker for the table gaming fans out there. We’re already highly impressed by the game selection offered at the casino, but it gets even better when you find yourself in the live dealer casino. There, players can indulge themselves in top class games with real dealers of course, but what really stands out is the sheer number of games on offer. We had never seen so many live games in one place before and the availability of blackjack, roulette and baccarat across multiple tables was complemented nicely by the availability of Texas Hold’em, casino hold’em, Caribbean Stud and even three card poker. It’s an amazing line-up and one that needs to be seen to be believed, so when it comes to the game selection alone, we can see why Viks Casino is so highly regarded. The banking options at the casino actually have plenty to live up to if they are to measure up to the games, but we were pleased to see that there was actually plenty going on at the casino to get excited about. There are more deposit methods than withdrawal ones, but the casino does everything it can to make everything available and as long as you’re happy with cards, electronic wallets and a variety of more localised options, you definitely will not be disappointed by what can be found here. The casino also supports a huge number of currencies too, including everything that players would expect and even some that we haven’t seen in a long time, such as the currencies of Peru, Venezuela and Nigeria. Support is offered by live chat and email, although we would not mark the casino down for not having a phone number as live chat has pretty much made that unnecessary nowadays. It’s a great support experience and rounds off a casino gaming opportunity that really stands out as being one of the very best out there right now. At risk of sounding too excited, we absolutely loved having the opportunity to play at Viks Casino and have already added it to the rotation of casinos that we play at ourselves. It is an outstanding brand that brings games, promotions, banking and support together like few others. Considering the casino has only been around since 2016, we have found it to be absolutely stunning and has delivered plenty in such a short space of time. If you’re looking for somewhere to play live games, all of your Microgaming and NetEnt favourites including jackpot titles and plenty more games besides, then you won’t go wrong here no matter which language you speak and which currency you use.